It's trip report time again! I love trip reports! 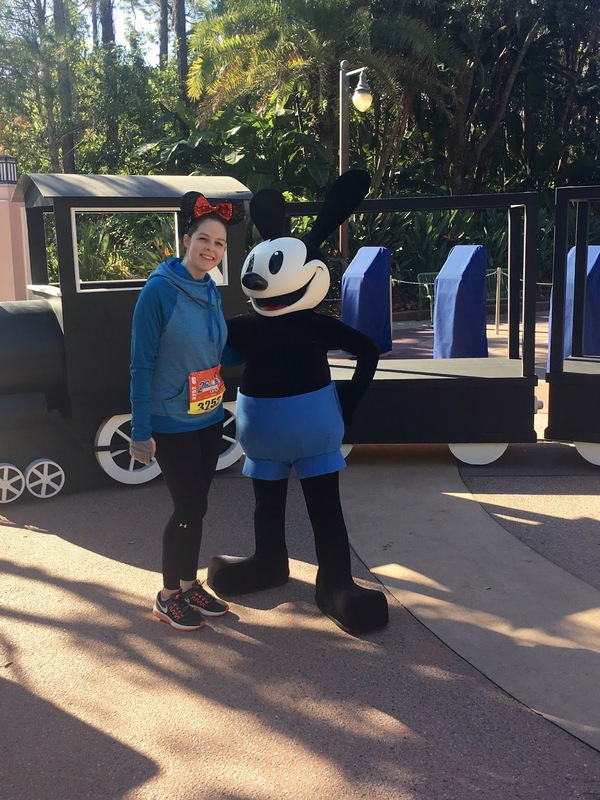 I'm recapping my January 2017 trip to WDW for the marathon. You can see all the posts in this report here. Onward! FLORIDA, YOU HAD ONE JOB. 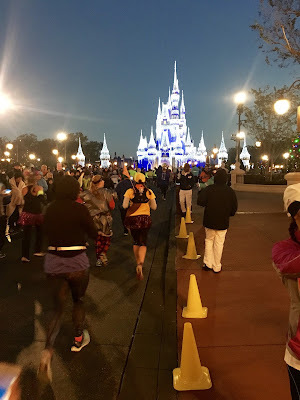 I hear tell of a mythical WDW Marathon some years ago where it was so cold the course was marked by snow and sleet. This is the only possible way the weather for this year's marathon could've been weirder. The forecast called for a temperature just under 40 degrees at the start of the race; I had known that coming in. What caught me - and many others - by surprise was the addition of wind gusts and an accompanying chill that brought the real-feel down to about 30. The high for the day was about 55, but we wouldn't expect to see that until well after I finished. I woke up just before 3am the morning of the race with an unusual task for runDisney races: begin piling on the layers. First my KT Tape, then long running tights. 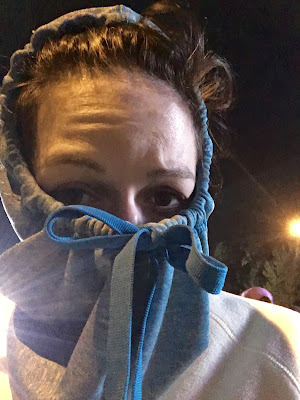 Four layers on top: long sleeve tech tee (the one from the race; I hadn't expected to need one), then a running tank, then my big Target running hoodie with the hood you can pull up over your nose, and then my throwaway fleece. I rather wondered if I'd be able to throw it away. Once ready, I stepped out the door and... I was okay. Not great, mind you, but okay. But when I boarded a bus I walked all the way to the back, because who's in a hurry to get off the bus? The starting area was similarly tolerable but not pleasant. There was a merch tent open, and having been driven out of the expo by crowds the day before, I decided to check it out with the additional bonus of warming up a little. Well, I was not the only person to think of that - in fact, the vast majority of people didn't seem too interested in the products, only the extra protection the tent provided. It was difficult to navigate, and when I found myself wedged between people in an effort to see a jacket, I figured, why fight it? Which is how I came to spend about ten minutes in the tent, just hanging out. 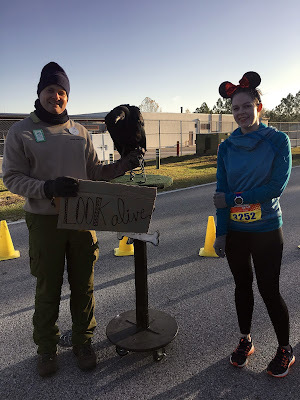 Eventually, though, my guilt over taking up space got to me, plus I of course had stuff to do, corrals to make, and I shouldered my way back into the cold. 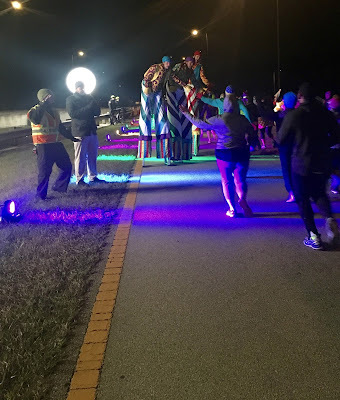 One porta potty stop later (pro tip: do NOT wait to apply your skin lubricant in the porta potty when it's cold) and I began the long walk to my corral. A lone advantage of the chill was that, despite it being only half an hour before race start, a comparative few had made it to the corrals yet. I was able to walk up toward the front without difficulty. And as I stood there, hopping from one foot to the other, my gigantic hood drawn up over my mouth and nose like an Eskimo, a startling thought occurred to me: was I not going to enjoy this race? 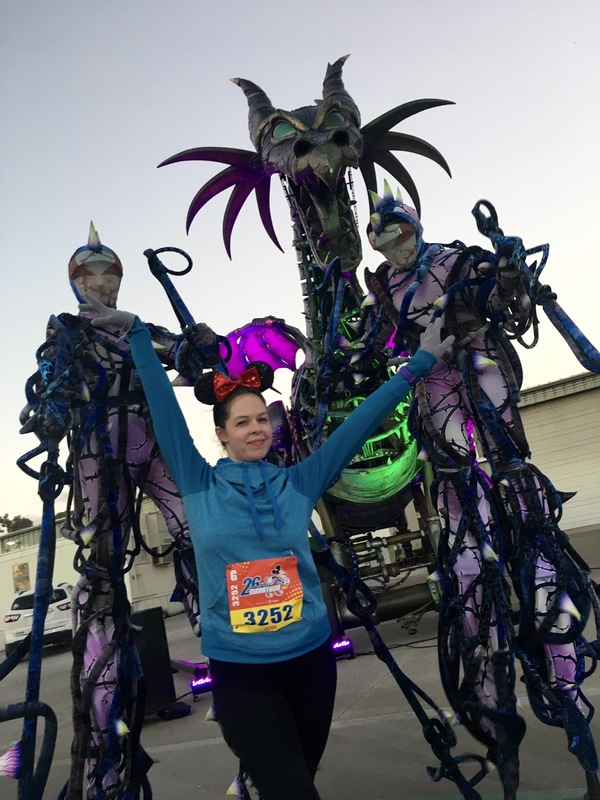 This, my favorite race? Was it simply too cold for me to enjoy happiness? 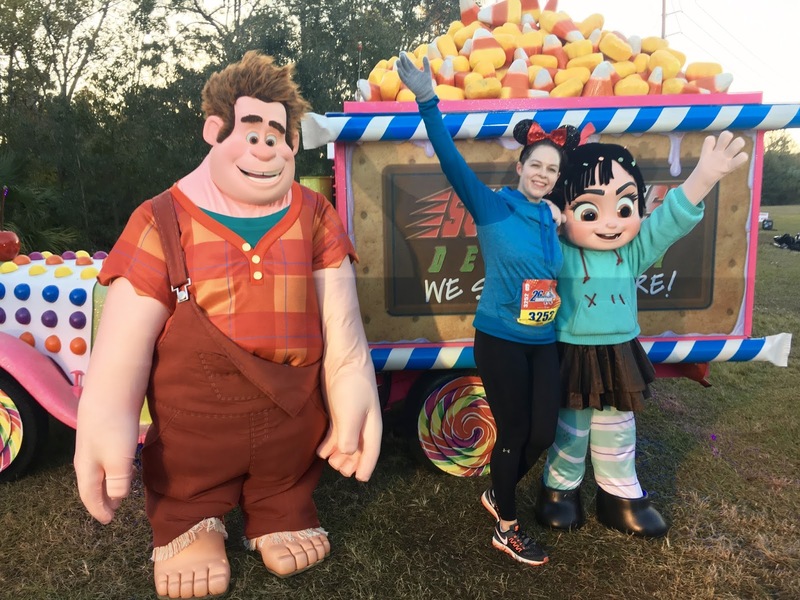 Hello and welcome to the WDW Marathon. I am your host, Nanook of the North. Only one way to find out. 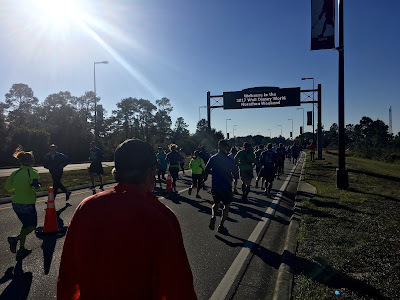 The race started, the corrals moved forward, and when it was my turn I ran. The first bit of good news started with my lungs. They have a habit of seizing up at even the suggestion of cold; see the Tinker Bell Half 2014 for proof. Despite the frigid conditions... nothing! My breathing wasn't labored at all! Score. And I found, too, that as I moved I was, in fact, and all fears to the contrary, warming up. I was even able to push down my hood and affix my Minnie ears properly. 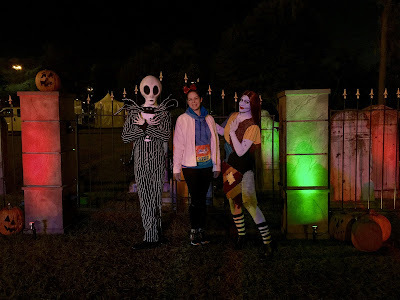 After a quick stop for a couple photos, I blasted through the Magic Kingdom parking lot entrance, sliding to a stop in favor of a not-too-long line for Jack Skellington and Sally. This ultimately turned out to be probably my longest stop, as Jack and Sally took a brief break to warm up while I was in line, but it was well worth it. Jack greeted me with a hearty "You can run as fast as you can but you can't outrun dysentery!" and sent me off with an encouraging "Let your fear fuel you!" Neither of which are from the movie, so I guess he's just dispensing advice now? 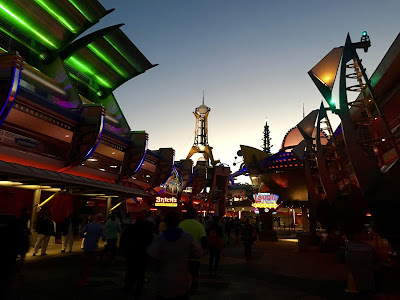 Before I knew it I was running down Main Street, into Tomorrowland, Fantasyland, and around in Frontierland (at which point a lady asked me "What park is this?" which I found interesting...). I passed the Country Bears but the line was long-ish and I'd gotten them last year, so pass. Then it was through Liberty Square, where I only saw JJ but I understand Sam Eagle was out too? Sorry I missed that one. Only Elsa was hanging out on the castle - I wonder why there's no photo op with them? Not that I was too concerned - I was more into my photo op with the castle itself. 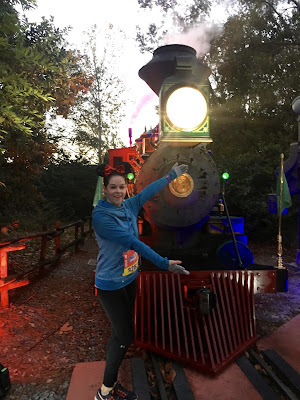 As we exited the Magic Kingdom I caught a photo with a steam train for my dad, who's into trains, then stopped again for the Maleficent dragon float because the line wasn't too long. 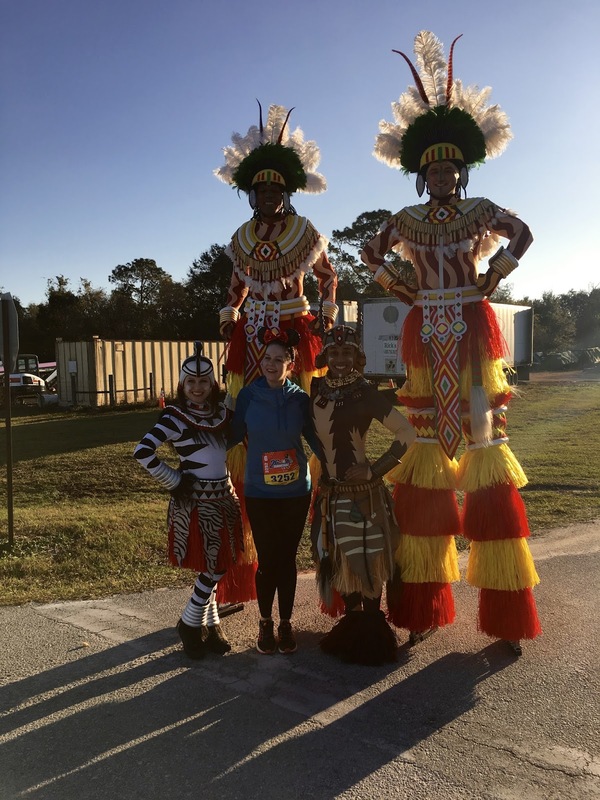 Sadly the CMs did not fully capture my pose; it was so ballet-y a stiltwalker awarded me a "YES GIRL!" right behind my ear, which kept me smiling for at least two more miles. Then it was around the monorail resort area and into a stretch of... roads. Which were mostly boring. 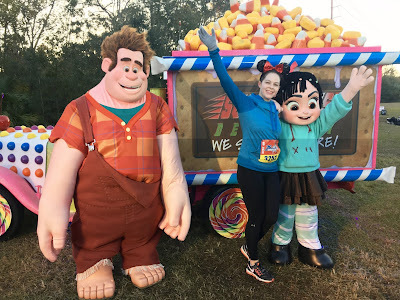 I did catch photos at the Attraction Graveyard and with Wreck-It Ralph and Vanellope Vanelloppe Vannelloppe Sarah Silverman Baby Talk CGI Girl. A few miles later and we were approaching the Animal Kingdom; obligatory Festival of the Lion King photo ensued, but there weren't as any animals out as usual. I've seen a couple freak out on occasion; maybe that's it? 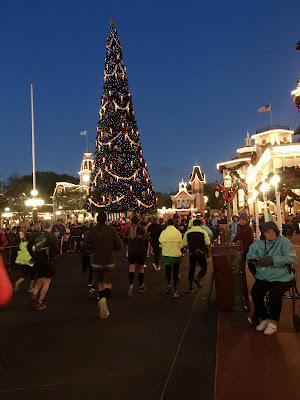 One of my great strengths as a distance runner is the ability to disconnect my brain from my feet. If I can find the right daydream I can run minutes or even miles at a time without noticing. This only presents a problem at times when it comes to photos in races. I'll think, ooh, I should take a picture of that! But my feet are like, sorry, we already passed it. I mention this phenomenon because I felt it most keenly here: as we approached the Thirsty River Bar just before Everest, I saw a CM holding up a handwritten sign reading THE BAR IS OPEN! And at 8:32am (I looked), 13.1 miles into a marathon which, to be clear, is only halfway done, people were stopping off to buy a beer. I did not buy one myself but I love that others did and am still kicking myself for not doubling back for a quick picture. Oh well. Next time. All of which is to say that I came upon Expedition Everest at 8:32am. Good news: ahead of last year's time! Bad news: no way was I gonna wait up to 28 minutes to ride. I kept running. With the exception of the long line of cheering spectators, exiting DAK is one of my least favorite parts of this course - because I know that it will be miles before I reach my next "park," and when I do it will be the ESPN Zone Wide World of Sports. 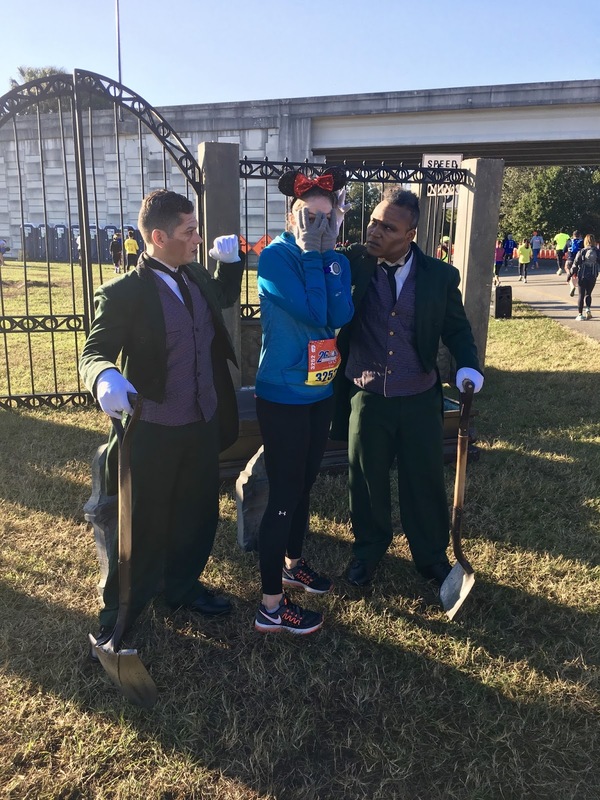 Cue Haunted Mansion gravediggers. Although I must say WWoS was not as much of a marathon purgatory as I felt it was last year. Maybe because we hit it around mile 20 instead of 17 and therefore the wall was behind me? Whatever the reason, I breezed through the area and exited feeling strong. I knew all (all! Ha) I had to do was make it up the Green Army Man hill and then I was on the road to the Studios. Oswald says 'sup. Mind you, the Studios were a total drive-by this year; given the construction we basically entered, ran down the main drag, and exited the park. Which is a little sad because I found the spectator support to be excellent there last year, but no matter because we were about to hit the most spectative area of all... the Boardwalk! The Boardwalk is invariably filled with tons of tons of enthusiastic crowds, at least one of whom usually provides me with Swedish Fish (thanks, random dude!). It's the perfect segue into the final leg as you enter the World Showcase. 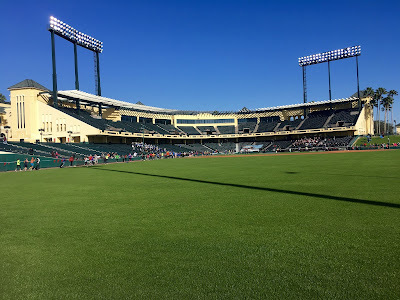 Note: I entered the World Showcase at 10:30am, approximately 30 minutes ahead of last year give or take corral difference and what have you. This is great. BUT. The WS characters are mostly not out until WS opens at 11am, so, lame. I did see Aladdin but that's it. Of course by then it was almost over - and I felt great. In fact I was able to pick up the pace a little as I charged for the finish line. Here's the real kicker. My official time was 5:08.22. My GPS watch numbers got a little bungled - a couple times I stopped the clock for a photo line and forgot to start it up again for a minute; a couple times I forgot to stop the clock in the photo line and all that time got recorded. It shook out at 4:58. I stopped for the bathroom twice and at least 12 photos... if I hadn't my time may have been as low as, oh, 4:55 or so? FIVE MINUTES FASTER THAN MY MARATHON PR. In the immortal words of Charlie Brown: AUGH. I'll be doing a post breaking down my last MCM vs. this race later on, as I believe many factors and decisions affected the outcome. But man, I wish those performances had been swapped. Oh well! I still had a great time - even the temperature couldn't get me down. 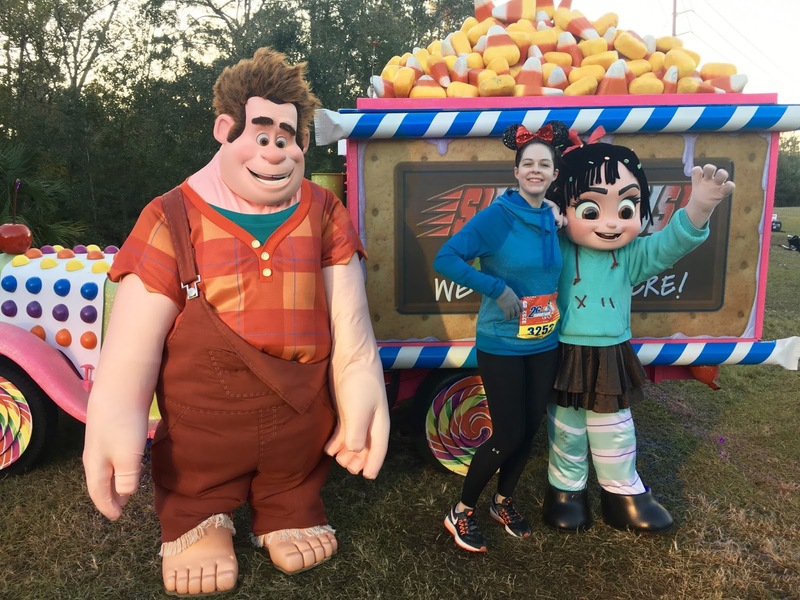 The WDW Marathon is my favorite of every race I've ever run and I hope I can do it again next year! But it better be warmer. 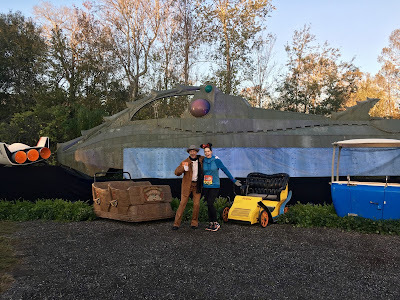 Next up: more WDW antics! Nice job!! I had brought some layers but not enough - luckily I ended up borrowing from friends. I debated throwing away more throughout the race but like you it always seemed to get windy when I thought about it haha. We would've needed ALL THE SHIRTS on earth to have enough layers! 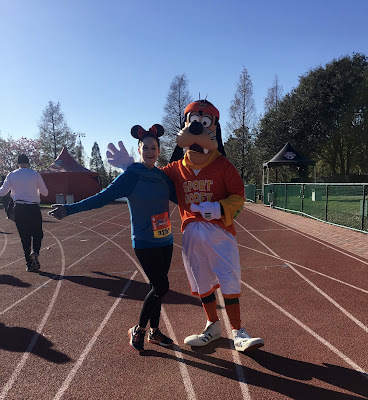 I was in corral G. Gloves are definitely clutch - I highly recommend you bring a cheap pair to any race you think MIGHT MAYBE POSSIBLY be even a little bit chilly. Worst case scenario you chuck 'em; Target has pairs for like $3. I've also just safety pinned them to my shirt when I no longer wanted them.